Why Do Bonfires Still Burn 400 Years On? From the BBC and presented by Professor Diarmaid Macculloch here’s an excellent site complete with images, text, and videos! iWonder – Why Do Bonfires Still Burn 400 Years On? This week marks the 409th anniversary of the Gunpowder Plot, which was an attempt to kill James I of England, kidnap his daughter, the Princess Elizabeth, and replace him on the throne with her as Queen. The attempt was, of course, unsuccessful, or else it wouldn’t still be celebrated today, in the form of Bonfire Night. Bonfire Night is exactly as it sounds, it’s a holiday where bonfires and fireworks are lit to celebrate something NOT being lit on fire. A delightful irony that. Religion had much to do with the origins of the Plot, which was pinned on Guy Fawkes and a group of Catholics. 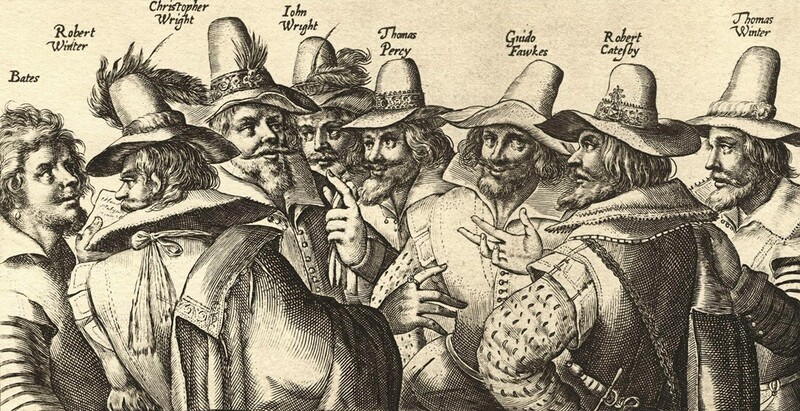 This band of men hatched a plan to explode the House of Lords on the State Opening of Parliament, which was to take place on November 5th, 1605. However, a last minute search of the belly of the building revealed 36 barrels of gunpowder and Fawkes. Fawkes played off like the was a serving man and almost got away, but he was apprehended and brought before the King the next day. James questioned Fawkes and tried to pressure him into revealing who worked with him, but Fawkes, under the alias John Johnson (yes, quite original), resolutely denied the existence of any co-conspirators, and insisted that he acted alone. While he gained some measure of respect from the monarch. However, that did not save him from torture. He held out for two days, but eventually recanted his story of working alone and gave up his comrades. His story does not end there. He was found guilty of high treason and sentenced to be hung, drawn, and quartered. When the time came for his death, he jumped from the scaffold, breaking his neck. Now, he is burned in effigy each year at Bonfire Night and his name, alone out of all of the conspirators, is remembered by the general public in connection with the Plot. There were others, and why did they do it? Catholics had had a hard time in England since Henry VIII’s break from the Church of Rome in 1534, with the Act of Supremacy which stated that Henry was the Head of the Church in England. His successor, Edward VI, was a staunch Protestant, but his eldest half-sister, Mary, was just as devoutly Catholic. During her reign, Catholics enjoyed a brief respite in the campaign against the Church. Mary’s reign was short-lived, and her younger half-sister, Elizabeth ascended the throne in 1558. While still not religious tolerance, Elizabeth’s punishments for Catholicism were less harsh than those of her brother and her church was more of a Protestant one, with a dash of Catholicism. Her successor, James I, was far more tolerant than any of the Tudors in the matters of religion. He had been head of the Church of Scotland since ascending the throne of his homeland while still a young child, and became head of the Church of England in 1603.